Obituary* say 7 May 2007� Charles A. Sewell, SR, of North Little Rock, passed away Sunday, May 6, 2007. Charles was born in Shuler, AR to the late, John Henry and Amanda Britt Sewell. He was preceded in death by his parents; wife, Ruby Maxine Sewell; son, Charles Sewell, Jr; brother, Rusty Sewell; sister, Faye Williford. He retired as a Baptist Minister and was a member of Levy Baptist Church. He is survived by one grandson, Charles A. Sewell, III; two granddaughters, Christine Jorgenson and Amanda Sewell; five grandchildren; and daughter-in-law, Phyllis Sewell. The funeral service will be at 11:00 a.m., May 10, 2007, at Roller-Owens Funeral Home Chapel (791-7400). Graveside will follow at 3:00 p.m. at Fredonia Cemetery, El Dorado, AR. Find A Grave Memorial# 17200670. Find A Grave Memorial# 19280617. Correspondence from Paula Sewell Reynolds (Mrs. R. M. Reynolds) to Lew Griffin. Find A Grave Memorial# 17200714. Find A Grave Memorial# 13548334. Ruby Lee Sewell, 96, of Monroe, La., died Monday, March 6, 2006, at Christus St. Joseph Rest Home in Monroe. Born April 18, 1909, in Union Parish, she was the daughter of Jess M. and Gertrude Richardson Lee. A homemaker, she assisted her husband, the Rev. James Ralph Sewell, in his ministry with the Methodist Church at Wesley Foundation at the University of Arkansas at Little Rock, Stephens United Methodist Church, Parkdale United Methodist Church, Douglasville United Methodist Church and Forest Park United Methodist Church. She was a member of the First United Methodist Church in Monroe and American Legion Auxiliary 40 & 8 Society. She was preceded in death by her parents, her husband, and an infant child. Survivors include her sons, the Rev. 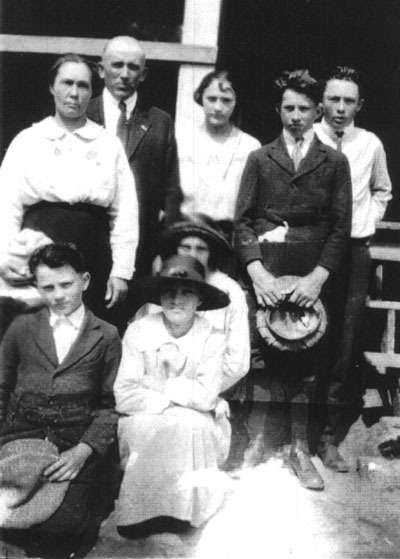 James Harold Sewell and his wife, Charlotte, of Nashville, Tenn., and Ralph Lee Sewell and his wife, Mary Agnes, of Monroe; a sister, Mabel Lee Burns of El Dorado; and several grandchildren, great-grandchildren and nieces and nephews. Funeral will be at 2 p.m. Thursday in the chapel of Bailey Funeral Home in El Dorado with her son, the Rev. James H. Sewell, officiating. Interment will follow in Fredonia United Methodist Cemetery. The family will receive friends from 12:30 p.m. until service time Thursday at the funeral home. Ancestry.com, Public Member Trees, Adam Emerson Family Tree. Find A Grave Memorial# 17158717. E-mail written 2002 to Lew Griffin from Bill Sessoms. E-mail written 1 Feb 2010 - Aug 2014 to Lew Griffin from Ashley Aden, e-mail address.